Fabrice and Valerie Closset-Gaziaux both have educational backgrounds in agronomy and earth sciences. After having spent extensive time working to develop sustainable farming practices in Africa and then helping growers in the Loire develop organic and naturally balanced vineyards for 8 years, they decided (in 2008) to procure vineyards in South-Revermont, in the “premier plateau” of Jura. Fabrice and Valerie acquired 5 hectares of land on which they grow Pinot Noir, Chardonnay and Savagnin and employ biodynamic farming practices. They emphasize patience and observance as two necessary principles for understanding their locale, and learning from their sites to better accommodate a balance in the vineyard. Champ Divin’s cuvée of chardonnay is fresh and delicate; notes of pear, along with hints of yellow peaches and biscuit on a finely tuned finish. A delicious and very approachable example of Jurassien chardonnay. Champ Divin’s cuvée of pinot noir is fresh and snappy; crunchy cherry, along with hints of damson and anise on a finely tuned finish. A great example of Jurassien pinot noir at its finest. Plenty of ripe fruit keeps this this zero dosage Crémant from being overly austere. Champ Divin's farmer fizz gets all of the first pass (early picked) fruit, and then only free run juice. Champ Divin’s Soleil Blanc hails from a single parcel known as Aux Molates. Floral notes of nuances of fresh pineapple make the Soleil Blanc a worthy accompaniment to delicately spiced dishes. 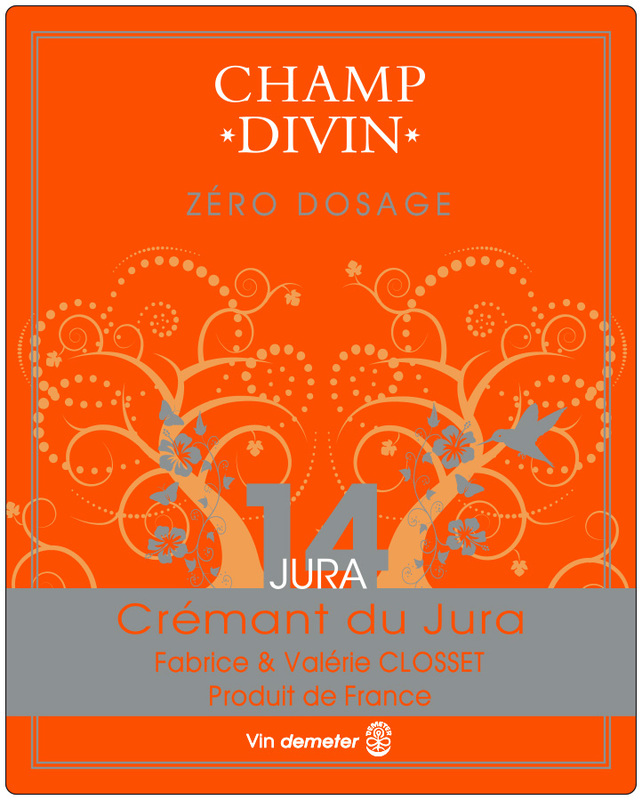 Champ Divin's Chardonnay - Savagnin is produced in the Ouillé manner – a non oxidative style of wine making. The emphasis here is more on freshness and vibrancy. A baby Vin Jaune. Spearmint, citrus, honey, spice, etc. Super complex and very long. Champ Divin's spirit for their Macvin is distilled in house and aged 2+ years before blending. . The result is a very elegant wine that works very well both before and after dinner. Reminiscent of a high end flavored grappa. The spirit is distilled in house and aged 2+ years before blending. Further aging before bottling allows everything to harmonize and gain some added complexity. A phenomenal pairing with blue cheeses, dark chocolate or dried figs.